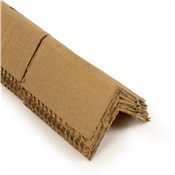 3" X 3" X 12.5"
This Heavy Duty Edge Protector provides support for double-stacked units. Maintains strapped and wrapped units. Reduces load shifting. Adds internal strength to cartons for extra stacking abilities! Size:3" x 3" x 12.5"